In most flowering plants, the development of a seed starts with the fertilization of the female gametes by two paternal sperm cells. This process is known as double fertilization and it leads to the formation of two fertilization products: the embryo and the endosperm. The embryo is diploid, with one maternal and one paternal genome copies, and it will develop to form the next generation, in the form of a new plant. Surrounding the embryo is the endosperm. This tissue is triploid in most plants, with two maternal and one paternal genome copies, and its function is to nourish the developing embryo. Thus, the endosperm is functionally analogous to the mammalian placenta. Finally, surrounding the two fertilization products is the seed coat. This structure is derived from the maternal ovule integuments and receives no direct genomic paternal contribution. This means that a developing seed contains three genetically distinct entities, that have to coordinate efforts in order for the seed to develop successfully and ensure the transmission of the parental genomes. Although most plants require fertilization to initiate seed development, some species can start this process autonomously, without paternal contribution. These species are called apomicts and the process by which they start asexual seed development is apomixis. Although most species are not capable of undergoing apomixis, mutants have been identified over the years that mimic apomictic seed developing seeds, or seed-like structures, even in the absence of fertilization. The genes whose mutations underlie these phenotypes code for Polycomb group proteins (PcG), which associate to form the Polycomb Repressive Complex 2 (PRC2). This protein complex is involved in the establishment of the repressive histone mark trimethylation of lysine 27 on Histone H3, which selectively silences target loci. In Arabidopsis there are three PRC2 complexes (FIS-, VRN- and EMF-PRC2), that act during different stages of the plant life cycle. These complexes are active in unfertilized ovules and block seed development if no fertilization takes place. This allows the maternal plant to save resources if no embryos are formed. However, this also means that these repressive blocks have to be removed after fertilization in order for the seed to initiate its development. 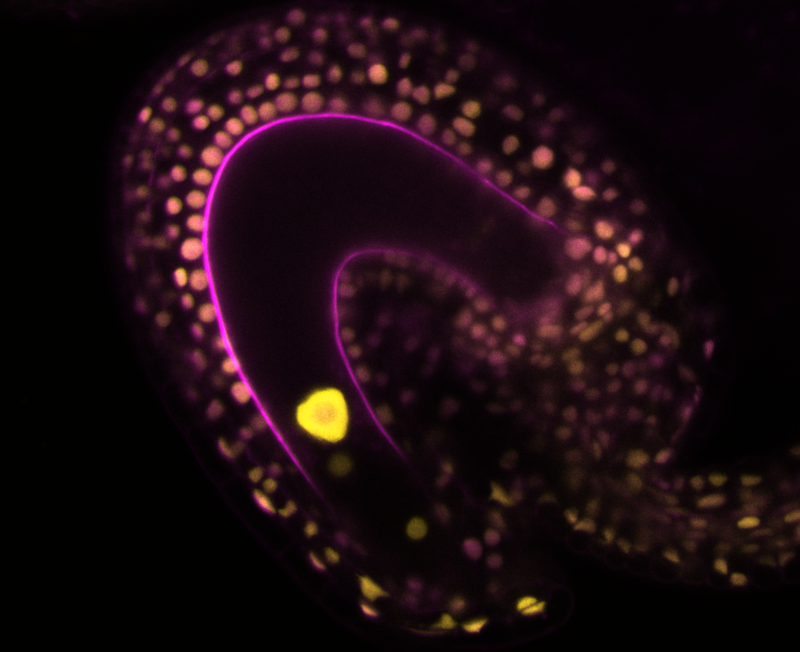 We are interested in the post-fertilization mechanisms that are required to initiate seed formation and thus bypass the PRC2 block on seed development. Namely, we are interested in the mechanisms involved in the development of the endosperm and of the seed coat. The endosperm, in particular, is a site for a process called genomic imprinting, or parent-of-origin-specific allele expression. This means that, for some genes, only the maternal allele is expressed, while the paternal one is silenced, and vice-versa. These genes are therefore called maternally-expressed genes (MEGs) or paternally-expressed genes (PEGs). This process is mediated by epigenetic factors, namely DNA methylation and histone modifications, that silence either of the parental alleles. Our research implicated the hormone auxin as a major factor involved in initiating seed development. Auxin biosynthesis genes are imprinted in the endosperm, and only expressed from the paternal alleles, while the maternal ones are silenced by FIS-PRC2. After fertilization, auxin is produced in the endosperm and is involved in driving its proliferation. Furthermore, our research also indicates that auxin is exported from the endosperm to the integuments and that this process is mediated by a Type I MADS-box transcription factor called AGL62. In the integuments, auxin leads to the removal of the VRN- and EMF-PRC2s, lifting their repressive block, and allowing the seed coat to form. Although we have begun to understand what the mechanisms are that lead to seed formation in flowering plants, we are still far from understanding the whole picture. Our current research aims at filling those gaps in our knowledge and provide a comprehensive understanding of what are the mechanisms necessary for the formation of a viable seed.